Studio quality comes to the stage. 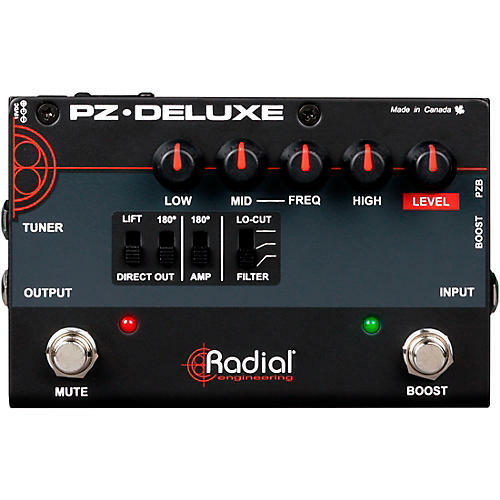 The Radial PZ-Deluxe is a studio-quality instrument preamp that works well with a wide variety of pickups and transducers. Apart from its studio applications, it packs a full array of features into a compact pedal that is great for live stage use. The control panel is well appointed with input gain, 3-band semi-parametric EQ with variable mid-frequency, three position low frequency resonance filter and 180-degree polarity reverse switches to eliminate acoustic hot spots that cause runaway resonant feedback. A guitar level output delivers the sound to the artist's stage amp while the built-in Radial direct box feeds the PA system. This balanced low impedance output enables the PZ-Deluxe to drive long cable runs of over 100 meters (300 feet) without noise. A separate tuner output enables quiet on-stage adjustments by depressing the mute switch. And for solos, a variable power booster with set & forget level control lets you punch through the mix when needed. The PZ-deluxe eliminates the need for a preamp. Simply activate the PZB gain stage and the PZ-Deluxe automatically elevates the input impedance to 10 meg Ohms and connect the guitar directly to the studio quality preamp for smooth, natural performance. Order now and have a new friend in the studio and on stage.